I loved this imagery, not only was it vivid but it appealed to my humour too. She is also warned by the same elder to never get, “talons like a witch” Uli is from a poor family in a village untouched by modernity. She is taken to a township (hey that’s what they called it in the film!) to become a housegirl for her uncle and his wife. It is her first time in the city. From becoming scared she becomes obsessed with the cars (In one day mind you!) This whole scenario seemed badly thought out in the sense that the filmmakers couldn’t decide whether she would be impressed by or frightened by the cars and so decided to make her both impressed and frightened which didn’t really make sense in my opinion. Another day goes past and Uli waves at the Prince’s car excitedly as it goes past. On this day the Prince insists that the driver stops. Uli and the gateman see this and think that they are in trouble and so flee. The prince is stunned by this action, but because of their disappearance has no choice but to return back to his car. Of course that was not the reason that he came to the house. He came because he was intrigued at her apparent innocence and wanted to get to know her better. The Prince does get to know Uli and becomes very fond of her, which leads to a marriage proposal. The queen is outraged that her son has brought in a girl with no social standing, wealth or worldliness and demeans her at every possible chance. The prince transforms Uli in terms of housing, clothing and acquaintance with the finer things in life and after the transformation takes her to his mother The Queen. The queen is very impressed this girl, not knowing that it is “Uli the village girl” and makes her approval well known. It is when he has her approval that her son the Prince reveals who Uli is. The Queen is shocked into silence and ends up begging for forgiveness. In the end they are married and both families are accepting of the union. Although this film was simply told and told a million times before it is still one that you will enjoy watching. This film teaches us that social status, clothing and money do not make a person. All these things are changeable. The prince was a man of great social standing and still was a humble and compassionate person. The gateman was a man lower on the social ladder, and had no compassion for those that shared his same background. It also shows us that what a person was yesterday is not necessarily what they will be tomorrow. They are good lessons to learn. Ini Edo's first lead role…….nice movie!! This 1 was a beautiful 1… i fell in love with Ini Edo in this one, and kenneth muah i so love him too. my favourite part was the aeroplane scene it was funny. Yes that was funny. These were the days when even a simple story could come alive like it was new. Please maam elevate this movie to 100%, pretty please? I love ini edo in this movie and the eeerrrooooprane part!! One of my best movies! And hilda's 'a Uropean' classic!!! 100% am sorry oo… Noooo! LOL I liked it too but I did not die in excitement over it!!! I hear you. We can only hope for better. Every now and then there is a stroke of genius. This movie was magnificent,it is the kind of movie no matter how old it is, you never get bored of it,as her first major role ini Edo was excelent so were all the actors actually (LIZ BENSON COME BACK TO OUR SCREEN lool)anyways it was a great movie,the story everything,and i love the way the prince was so humble and respectful of others no matter what his position was,such an exemple.I could watch this movie many times without getting bored,no lie,the end was touching and emotional thats what made it nice. All this praise for it making me wanna watch it again! holler, World Apart. great movie wonderful story, interesting acts, amazing sites and locations. but there is one thing that kept me glued to that movie the entire play-time, the classical sound track. i love it. please may know the name of the composer and the title? i'll be glad to receive it by e-mail. thank you! honestly speaking, i so much fel,l in love with this particular movie. its so interesting with lesson. even now thay am reading the story all over again, it still make me laugh uncontrollable. especiall the part of the gateman saying ‘bush girl, i told you not to wave ur dirty hands again’, and ‘he has come to arrest you’ its funny to me. the naration too is nice. please i need the name of the taxi driver who took the prince to the village.thank you. 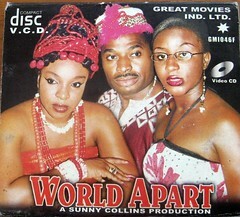 Dats awesome.what a fantastic Nigerian movie i’ve ever watched!Beauty is really in the eyes of the beholder.. I watched parts 1 & 2 and was quite touched. Its such an educative and amazing movie. There is no condition that is permanent accordingly.